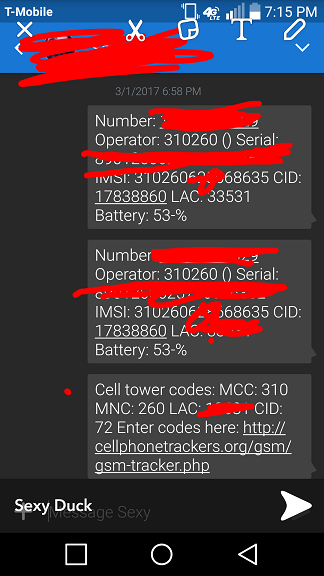 I have received quite a few messages and emails about my GSM tracker and its service since I got back. I think I need to make a little clarification about it as I expect to receive more such queries in the future and I may not have enough time to respond. I hope people will check this out before they start asking question or leaving messages on my Facebook page. What I have been and am doing is providing data service for a wide range of people and companies, not to end clients. For example, Michelin, some Chinese GPS tracker makers, some app developers, and police departments from US, Mexico, India, Pakistan etc. Among so many users only a few asked me in advance and got my written permission. So to be exact, I do not really know who were and are using my service until people contact me. I will take a few of them as an example. Please see below figure. A nice guy who I would like to call John sent me a screenshot that contains his location data and a link to my GSM tracker. He said that his wife’s phone keep receiving such text messages from his phone and he asked me how to stop it. I do not really know. Obviously some app developer integrates my service into his/her app and the link led John to me. So I suggested him to check the apps he installed. Another. It’s written in Italian. But no problem, we have Google translator. In English, it says ‘I want to cancel the tracking service on phone number + 39391xxxx271’. It’s quite confusing to me as I am not tracking anyone via cell phone. Although I do not know the details, I imagine that he has the same issue with John. As you can see, I will be of no help in his situation too. The only suggestion I can provide is check your apps. I now have the most extensive database across the globe and I provide two versions, free version for all and paid version for certain users who need API access. So it’s no wonder more and more people and companies are adopting my service without my knowing and it’s their freedom as long as they do not take my server down with thousands of queries at the same time. Unlike GPS which drains your battery quickly and may not be available in many places, cell tower tracking offers a more stable service with acceptable accuracy. That’s why more people like it. But issues arise too. I think they need to provide after-sales service, not me. At least they should let their users know how to stop the service. At the end of the post, I would like to emphasize that my service if free and open to all, but I do not provide any service to end users. In case you do not know yet, it provides location service to various users, but it’s not an app to install on your handset although I do have a mobile version, but that’s all.